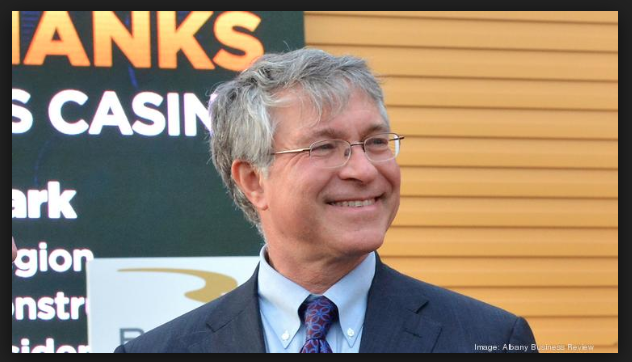 Rush Street Gaming’s billionaire CEO/Owner Neil Bluhm is back walking the halls of the New York State Legislature trying to get a tax break for their Rivers Casino at Mohawk Harbor. 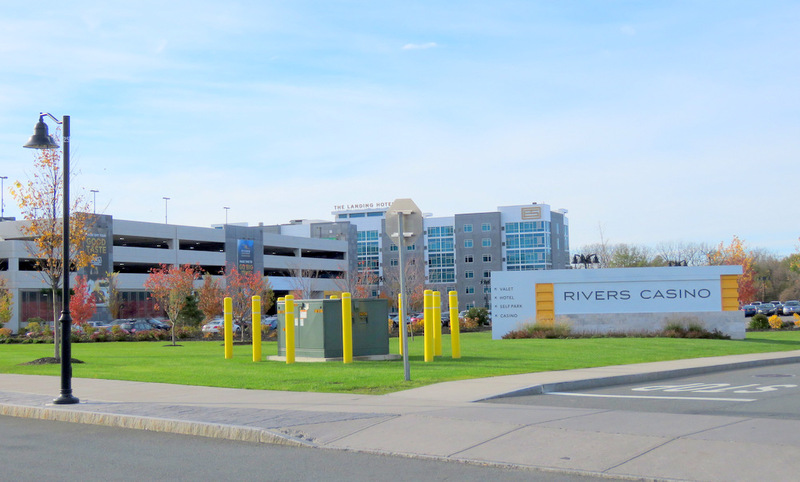 [See “Schenectady casino seeks lower tax rates: Tax credit floated as relief” (Albany Times Union, by David Lombardo, March 29, 2019); “Rivers Casino takes another crack at a tax cut: Schenectady facility says highest tax rate among New York casinos puts it at a disadvantage” (Schenectady Gazette, March 28, 2019)]. Below is the slightly edited text of an email that I sent to members of the media this afternoon (Friday, March 29), in the hope that the press will dilute Mr. Bluhm’s Casino Chicanery with facts, and that our Legislators will care about the facts. It has been supplemented with arguments against the Marketing Allowance. 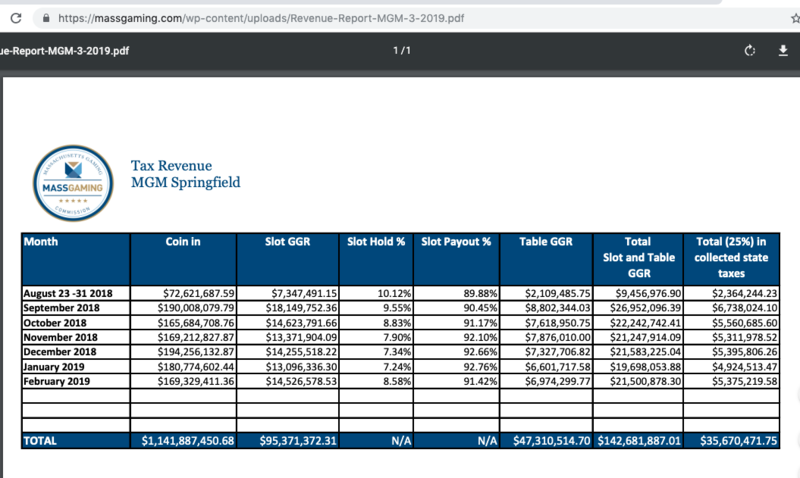 . . Left: MGM Springfield Tax Revenue Report . . 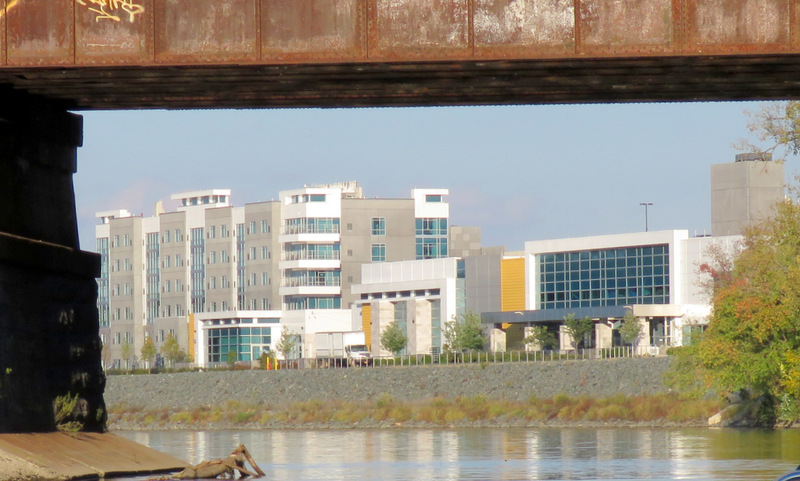 Rush Street Gaming is again seeking tax cuts from Albany for its Schenectady Rivers Casino, using misleading information and half-truths, plus a boatful of whining. The gaming revenue tax on a Capital Region casino, as stated in the 2013 enabling legislation, would be 45% on Slots and 10% on all other gaming revenue, with lower rates on slots in other Regions (that had less population density, fewer economic resources, and more competitors, i.e., racinos, Indian and Canadian casinos). MGM Springfield had received its license in June 2013 and was planning to build a spectacular casino resort on a bend of the Connecticut River, in the historic and cultural center of Springfield. The gaming tax in Massachusetts would be 25% on all casino gaming revenue proceeds (slots and table games). There might be a second full casino in western Massachusetts (but that has not happened). $2.5 million to purchase equipment and to provide training for police, firefighters and emergency medical services personnel. $1 million to redevelop Riverfront Park. $2.5 million to fund operating and other costs for police, firefighters, emergency medical services and education. $2.5 million for a Community Development Fund to be administered by the city to support early childhood education, higher education, libraries, health initiatives, and the betterment of the city and its residents. 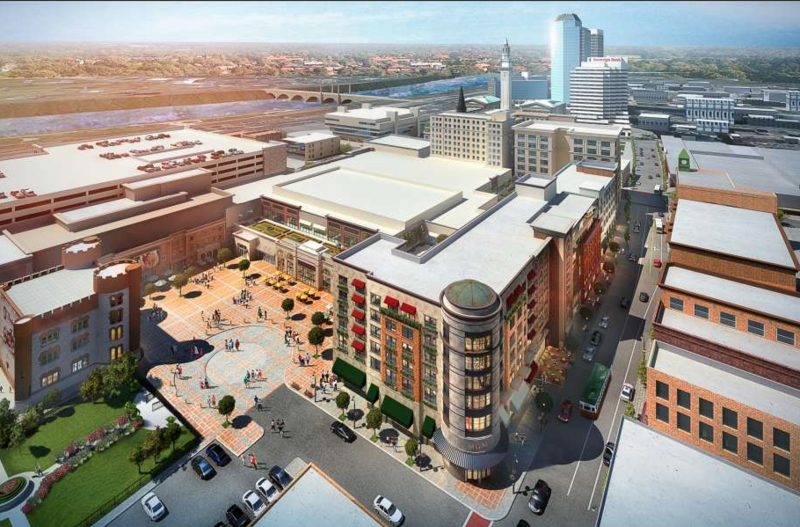 And, other $50 million coming up: Just last week, MGM Springfield reported to the Mass. Gaming Commission that it intends to invest in the proposed $55 million redevelopment of the long-vacant Court Square hotel building in downtown Springfield as part of an obligation to build housing within one-half mile of its resort casino. See WAMC Report. See the MassGaming 4-page Summary of Springfield HCA, for the amazing array of extra obligations MGM Springfield has undertaken while Rush Street just pays what it has to pay under the 2013 Legislation. It should be clear that the Massachusetts gaming tax structure intentionally took into account the obligation of any casino applicant to negotiate an HCA or Mitigation Agreement with the host municipality, with its consequent large financial obligations over and above the State gaming revenue tax. WHY DO PEOPLE TAKE BUSES TO MGM Springfield? Exactly a year ago, we were in the same situation, waiting to see if the rush to the Legislative Budget Deadline (April 1), would bring with it a budget that included casino tax breaks. See “bum’s rush needed” (March 28, 2018). We were pleased at the time that Gov. Andrew Cuomo did not favor casino tax breaks. 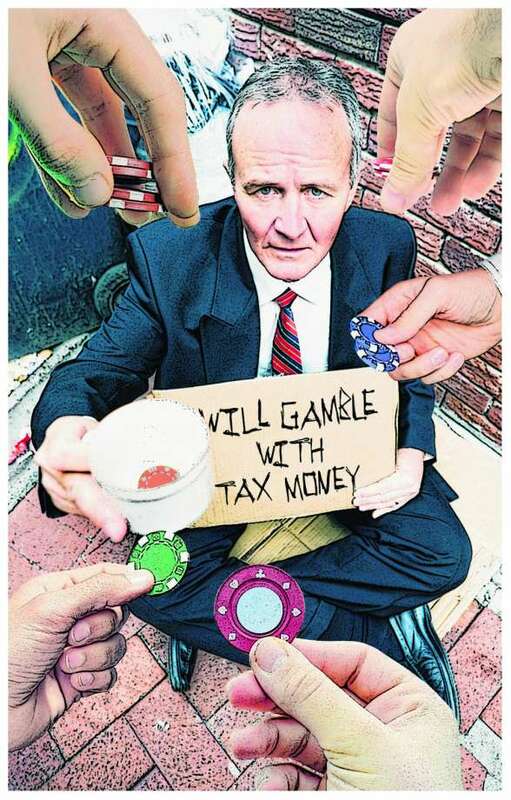 Also, the Gazette Editorial Board wrote a piece entitled “Editorial: No state financial deals for casinos” In addition, on Sunday March 30, 2018, the Times Union editorial board weighed in with “Editorial: Say no to casino subsidies“, which included the nifty illustration by Jeff Boyer that is at the head of this paragraph. 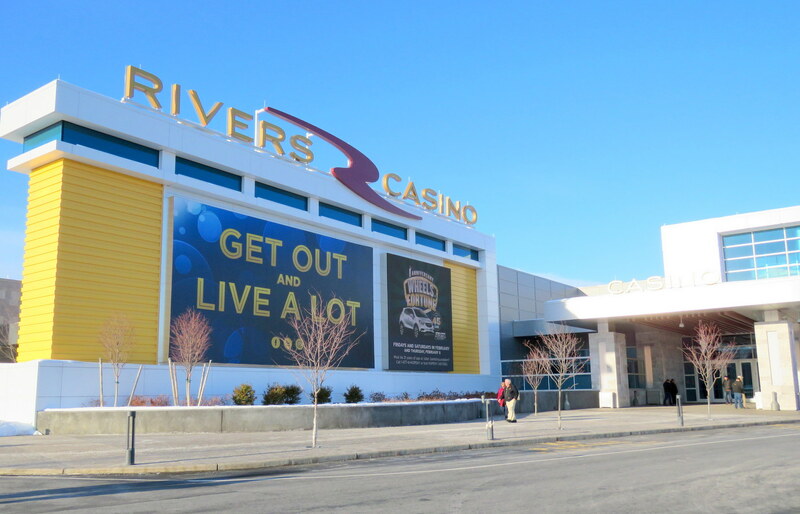 Much of Rivers’ marketing appears to be aimed at bringing in non-gambling customers to the Casino complex and Mohawk Harbor. That business (drinking, dining, conventions, fight shows, concerts) does not add to Rivers’ gaming tax obligations (45% on slots, 10% on table games and poker). 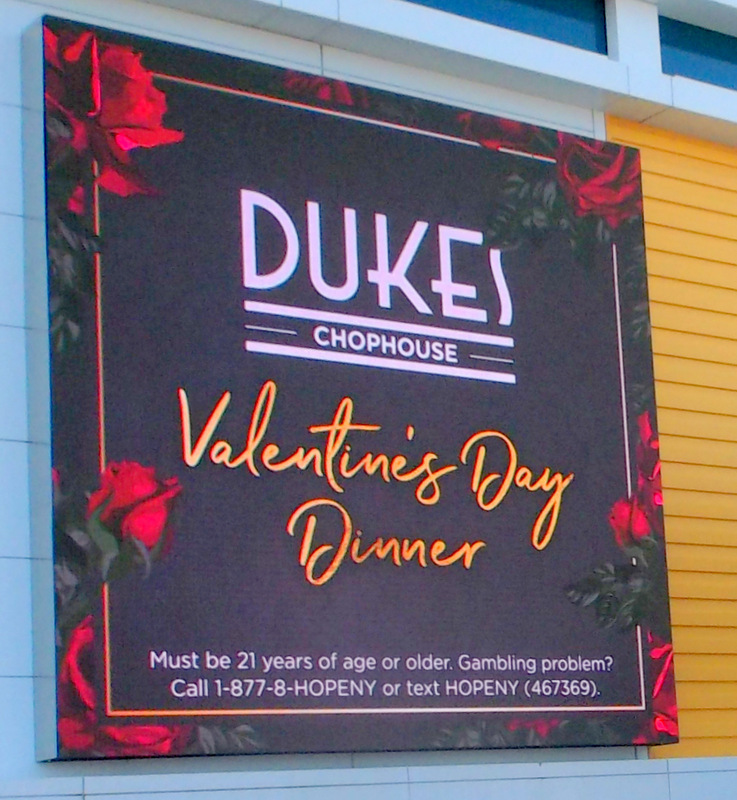 Instead, it merely increases profits for the Casino and its business associates, and generates the much lower taxes based on food and similar sales taxes (often “cannibalizing” the business of other local businesses). 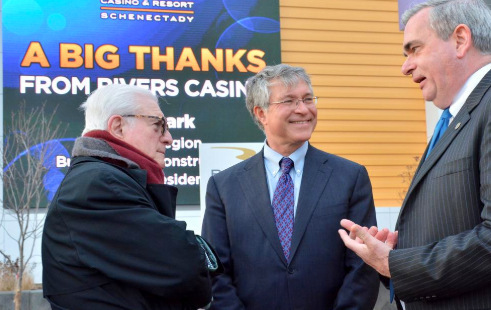 Rivers Casino is already a major beneficiary of the County’s Tourism Bureau and Discovery Schenectady programs for gaming and convention programs. 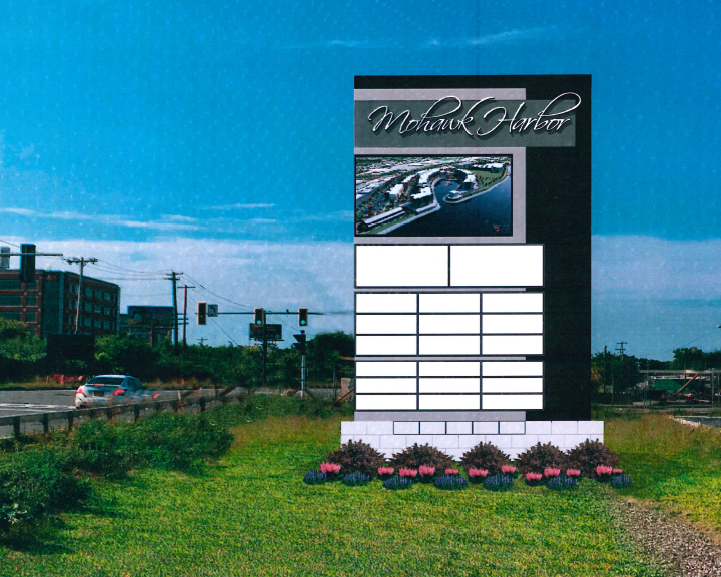 Mohawk Harbor was allowed to put a giant shopping-mall style 30′ high by 18′ wide pylon sign, that looms over Erie Blvd. at a location that normally would permit only a 7′ high sign under our Zoning Code. In permitting the sign, after literal begging for the favor by Metroplex Chair Ray Gillen, the Board of Zoning Appeals reversed a decision it had made just weeks before. The pylon sign contains a large LCD screen that changes message every 8 seconds; safety-conscious cities and planners discourage such distractions so close to a busy intersection. Isn’t this quite enough favoritism at the expense of the public interest for Mohawk Harbor and its Casino tenant? Phil Steck balked when I called him “the Assemblyman from Mohawk Harbor” last year. But, I cannot imagine the normally-thoughtful Mr. Steck offering even his current conditional support for the Marketing Allowance, were Mohawk Harbor not in his Assembly District. . . many locals believe this northeast Harbor Way entrance to Rivers Casino, with its utility bollards, parking garage, and Hotel, is the more attractive (and far less tacky) view of the Casino . . 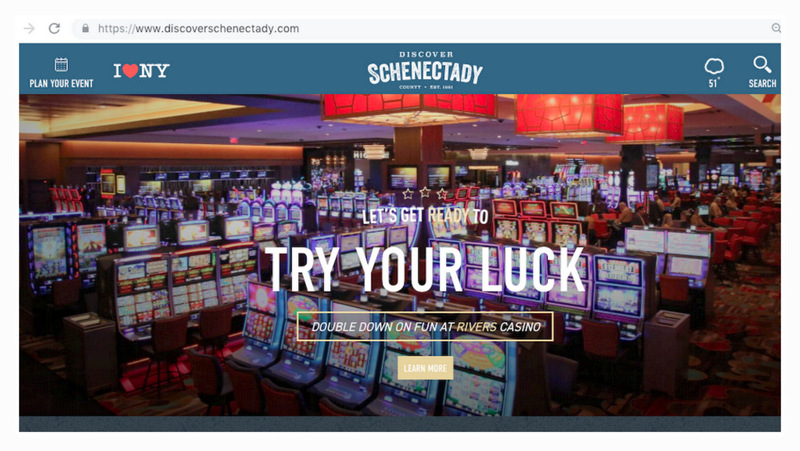 This entry was posted in Casino Competing, Revenue Promises, Schenectady Casino, The Snowmen Effect and tagged casino tax breaks, Host Community Agreement, Mayor Gary McCarthy, Rivers Casino, Rush Street Gaming, zoning & planning by David Giacalone. Bookmark the permalink.